The appearance of your fingernails plays a vital role to assess the status of your overall health. It has the capacity to grow quickly after being cut or damaged, and can imply some nutritional problems in the body. Changes in its color, shape, texture, as well as the nail thickness can indicate different body conditions. A person with fingernail ridges may have a deficiency of vitamins or minerals in the body, and may suffer from malnutrition. If you have lines on nails, vitamin deficiency may be the cause. The various B vitamins are mainly responsible for cellular growth in the body. Vitamin B12 specifically supports nail growth, so when it becomes deficient, lines on nails may occur. Besides, mineral deficiency can also cause problems on nails. An inadequate amount of iron stores can also result in lines on nails. Deficiency of calcium, zinc and vitamin C can cause nail abnormalities. Vitamin B, Biotin, Choline and Inositol are very important. Vitamin A takes an important role in proper nail health. Minerals like calcium, zinc, silica and iron are also important for nail health. Add essential fatty acids in your diet for nails health. Amino acids such as Cysteine, Methionie, and Taurine can help treat lines on nails efficiently. If you have lines on nails, vitamin deficiency may well be the reason. But there are also some other underlying causes. The appearance of vertical lines on nails is not usually a health concern. In most cases, vertical lines are normal fingernail ridges and are not a sign of any medical health problem. They are usually found to extend from the base of the fingernails to the tip, and are well aligned. Vertical lines on nails are associated with the aging process. 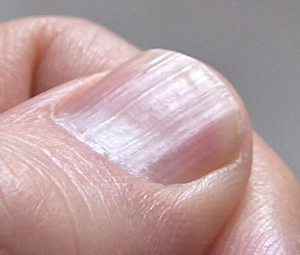 Horizontal fingernail lines are mostly noted as a clinical sign of an existing medical problem. White horizontal lines can be a specific sign for arsenic poisoning. Horizontal dents can be a result of malnutrition, uncontrolled diabetes or circulatory problems. Note: It is always a good idea to see your doctor if you have horizontal lines on nails. Now you know that if you have lines on nails, vitamin deficiency can be the culprit, so what can you do to deal with this condition? Consuming proper foods and herbs can help maintain the healthy status of the nails and treat abnormal appearance. Here are some examples of foods and herbs that can be used for the treatment of ridges on the fingernails. Eat foods which are known to be rich in silica content, such as green leafy vegetables, root vegetables, cucumbers, onion, cereals and oats. Green leafy vegetables such as broccoli, bok choy, and kale also contain vitamin B and folic acid which are helpful in the treatment of nail ridges. It is encouraged to have the slippery elm powder just before taking meals as this facilitates the absorption of minerals in the small intestines. Specific herbs that treat nail ridges include horsetail and gotu kola. Foods rich in essential fatty acids are effective to treat ridges on the nails, including fish, fish oil, avocados, evening primrose oil, sunflower, seaweed, nuts and seeds, walnuts, and wheatgerm oil. Include some digestive foods and enzymatic foods in your diet, including bitter lettuces, apple cider vinegar and lemon juice. They can promote better absorption of minerals in the body. There should be an adequate amount of protein-rich foods in your diet to improve nail health. Those foods include fish, organic chicken, red meat, nuts, eggs and seeds. When you have lines on nails, vitamin deficiency is one of the causes. However, nail lines can also appear if you don't take care of them properly. Proper nail care is very important to prevent the appearance of lines on nails. Here are some guides for nail care that you may follow. Wearing protective gloves is encouraged when you are doing some manual tasks. Regular application of moisturizing lotion on the hands can prevent nails from getting dry. Refrain from excessive hand washing as this can remove all the natural oil of the skin, leading to dryness of the skin and the nails. Nail hygiene has to be maintained by keeping the nails well-trimmed. Wash areas under the nails to prevent the growth of fungus. Use jojoba oil to massage the nails and the cuticles. The jojoba oil is known to promote nail health. Here are some preventive measures to observe to prevent lines on your nails. You should hydrate your body by taking enough amount of fluids, which is important for nail health. Consumption of junk foods should be avoided. Multivitamins might be taken, together with a healthy and balanced diet. Include a lot of vegetables and fruits to get enough nutrition for the nails.